Fried “karaage” chicken thighs that are ready-to-eat. Package contains 200g (about 6 to 10 pieces). Thigh meat from Poland was used, which was not treated with antibiotics. 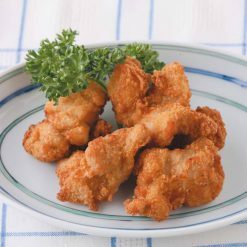 Enjoy “karaage” simply by heating up in the microwave! 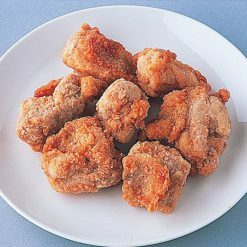 Karaage is Japanese style fried chicken (two words: kara age). They make a great appetizer and it is also a kid (and adult) friendly dinner, as well as a perfect small dish for your lunch box. 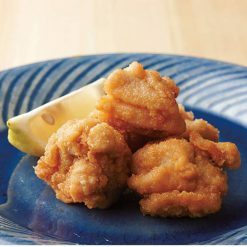 Karaage means deep fried food with no batter in Japanese, so you could also make fish Karaage. However, it usually means chicken. Enjoy on their own or with a salad or with a side of rice and miso soup. To defrost in microwave, take the frozen pieces out of the bag and place on a plate that is heat resistant.In a 500W microwave, place 3 pieces for/2 minutes and 15 seconds; 5 pieces for 2 minutes and 30 seconds or 7 pieces for 3 minutes.In a 600W model, put 3 pieces for 2 minutes; 5 pieces for 2 minutes and 15 seconds or 7 pieces for 2 minutes and 45 seconds.Heating times will depend on the microwave performance, so make adjustments accordingly. Please exercise caution, as the product and dish can both become very hot. This product contains chicken thigh meat (from Poland), breading [wheat flour, corn starch, wheat starch, eggs, salt, skimmed milk powder, sugars (sugar, glucose), spices, corn flour, egg powder, soy sauce, sake, sugar, ginger, garlic, salt , frying oil (rapeseed oil, palm oil), caramel color. This product is not suitable for anyone with allergies to egg, milk, wheat, soy or chicken. Origin of ingredients: chicken (Poland). Prepared and packaged in Japan.